Topics: Google+, English, Accueil, & Résidentiel. Age: It went live on November 12th 2002, making it over 15 years, 4 months old. 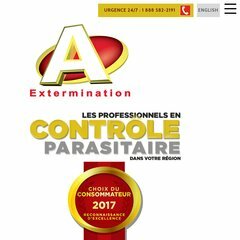 a-extermination.com Exterminateur, Extermination, Insectes, Fourmis, Rat, Souris ..
a-extermination.com - Mouffette, Cloportes, Araignée, Ténébrion meunier, Anthrènes .. It is hosted by Groupe Access (Quebec, Montreal,) using Apache web server. There are 2 Nameservers, ns1.cameleonmedia.name, & ns2.cameleonmedia.name. The programming language environment is PHP/5.3.16. PING (74.114.100.229) 56(84) bytes of data. Pinging the server, resulted in a 38.0 ms response.